Fruit flies, drain flies and other flies are more than a nuisance. They threaten the health, comfort and safety of your customers, spread bacteria and damage your reputation. That’s where Wil-Kil can help. Our Foodservice Program aggressively attacks the source of fly activity and delivers proactive solutions to prevent future problems. It’s a smart and effective strategy to reduce your risk and limit the hazards posed by flies. Our team has specific expertise in fly prevention and an aggressive, results-focused approach to eliminating fly activity from your establishment. An effective fly program requires a thorough understanding of fly biology, including their development and feeding habits. In cooperation with you and your staff, Wil-Kil’s technical team will tailor your Integrated Pest Management (IPM) solution with strategies to eliminate both larvae and adult flies. The methods we use will be determined by your unique situation and the type of fly in your location. To learn more about our fly control services in Madison, Green Bay, Eau Claire and throughout Wisconsin and Illinois, please contact us today. It takes only a small amount of organic debris to attract and support fly populations. Bioremediation is very effective at reducing fly, as well as cockroach and ant activity when sanitation is the source of the issue. A customized bioremediation service can complement your regular cleaning regimen, dramatically improving the results of your pest program. Wil-Kil’s Foodservice Program includes drain treatments, foaming to cleanse hard-to-reach areas and leveraging the natural and non-caustic benefits of good bacteria to digest fats, oils and grease. Flies will instinctively frequent particular landing zones such as walls, window sills and other interior surfaces. Landing zone treatments are invisible to your customers and provide an additional level of defense against fly activity. Insect light traps (ILTs) are an effective means of controlling most adult fly populations. Providing 24 hours a day protection, they rely on the fly’s attraction to light. Ultraviolet light is used to attract adult flies into the insect light trap that then captures them, using glue boards or electrocuting grids. Proper placement is important to the effectiveness of the trap. Wil-Kil offers a number of insect light trap options. Your IPM Designer will work with you to select the most appropriate model for your restaurants. What does your home look like to bugs and rodents? Is it a foreboding place, devoid of even a morsel of food? Or, is it a buffet restaurant filled with every delicacy imaginable? In order to determine this, you have to get down to their level and see the world from their perspective. It might actually startle you how many food sources are littered throughout your home. Where Did All These Flies Come From? You might wonder sometimes where all the flies keep coming from. They can be quite mysterious. 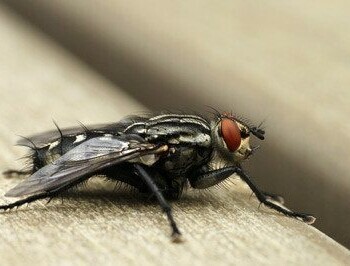 In ancient times people believed that flies spontaneously generated out of dead or rotting meat. But the truth is simple enough for a child to understand. You see, when mommy and daddy fly love each other very much--um, you get the point.